Hello Dealsnloot Readers,Askmebazaar come up with refer and earn offer.You will get Rs.100 on signup if you signup using our refer link and Rs.25 per refer. Refer money will be given instantly when your friend just register.You will get Rs.50 more if your friend do shopping on askmebazaarThis offer is very simple to avail. This is also valid on Web. So you can also avail this offer on your browser. There is no minimum purchase amount for this. You can buy anything from this. This is a big loot. You can earn unlimited money from this. This offer is very easy.Grab This Loot Deal and Get Unlimited Askmebazaar Cash Loot. Note :- Currently Redeem of Askme Cash is Not available and it will available after 4 days we have Talked with Askmebazaar customer care. Use this link to get Rs. 100 as joining bonus. Use this referral code if there is empty space. Now it will open your account. You will see all the earnings. 1.After Sign up Askmebazaar account. 2.Click on Invite & Earn option (Top upper menu bar option). 3.Again click on Invite & Earn option. 4.Enter your friend Email ID and share it via Facebook & Twitter. 5.Get your own referral link by sharing via any method. 6.Share it with your friends and family. 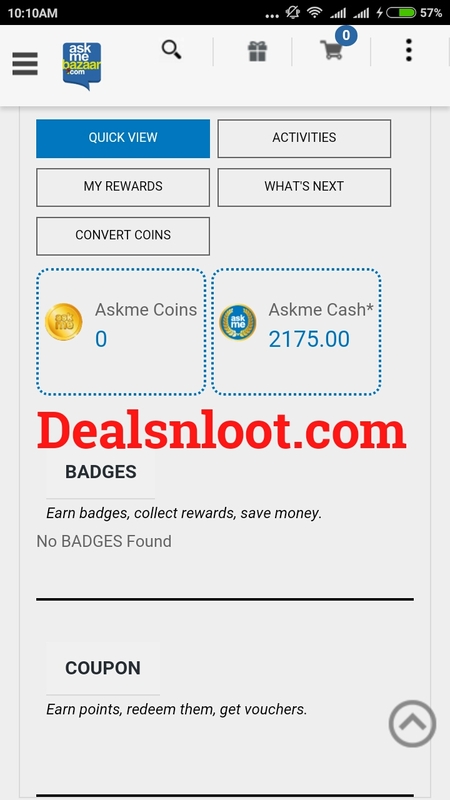 7.On each referral you will get 500 Coins in your account also you will get Rs.50 Askme cash when your friend shop at Askmebazaar. 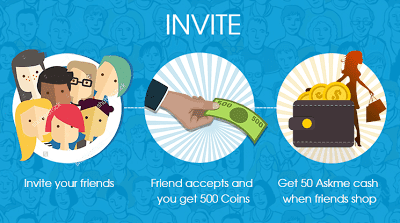 8.Your friend will also get 2000 Coins at sign up. 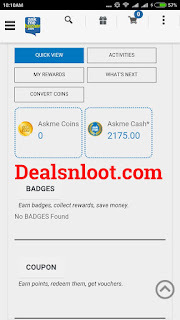 9.2000 Coins = Rs.100 Askme Cash. 10.Refer more friends and earn unlimited Askme cash for shopping. Here you can see your earnings. You will get Rs25 when your friend register’s and Rs 50 when they shop first time.